I have been feeling a bit “ordinary” lately. After being on the road full time for over a year, I can honestly say this is the first time that I have felt somewhat unsettled in my conviction to this lifestyle. I have even had a couple of those little pangs of “ugh, is this nomadic lifestyle too much for me while trying to hold down a full time job? And if I can’t get up the nerve to quit the job, well then….” But then I stop and ask myself, “If not this, then where?” No other option resonates like this one, so I will continue to press on and trust that my loss of mojo is just temporary. This rig is five years old now, and will soon roll over 40,000 miles. I realize it is never going to get any “newer” than it is right now. So I need to learn not to take it so personally when things go wrong. It’s only money, yet when something on the Winnie breaks, I feel the wound, as if it were my own shell. I have been taught to expect good in my life, and that is typically what manifests. So when things go badly, I don’t take it well. 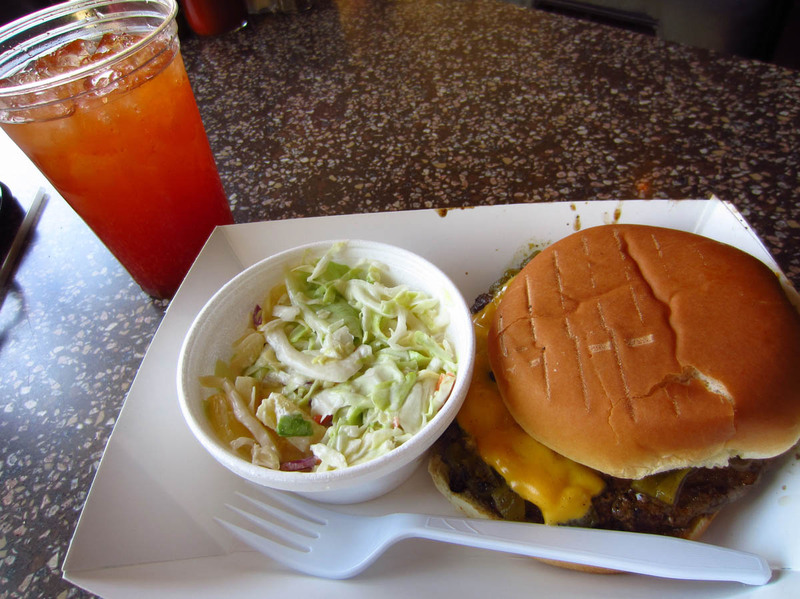 Is there a better Green Chili Cheeseburger than Sparky’s “World Famous?” I dunno…I’ll keep searching! 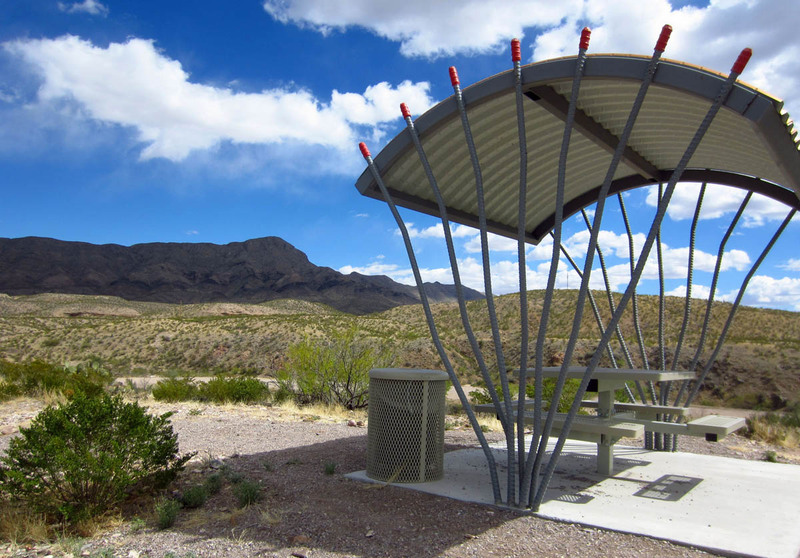 Rest area designed after the Ocotillo, along the “Healing Waters Trail” in T or C.
So for this reason, I decided I needed a splurge….and for me that typically means a nice long soak in a hot tub/spring or a massage. 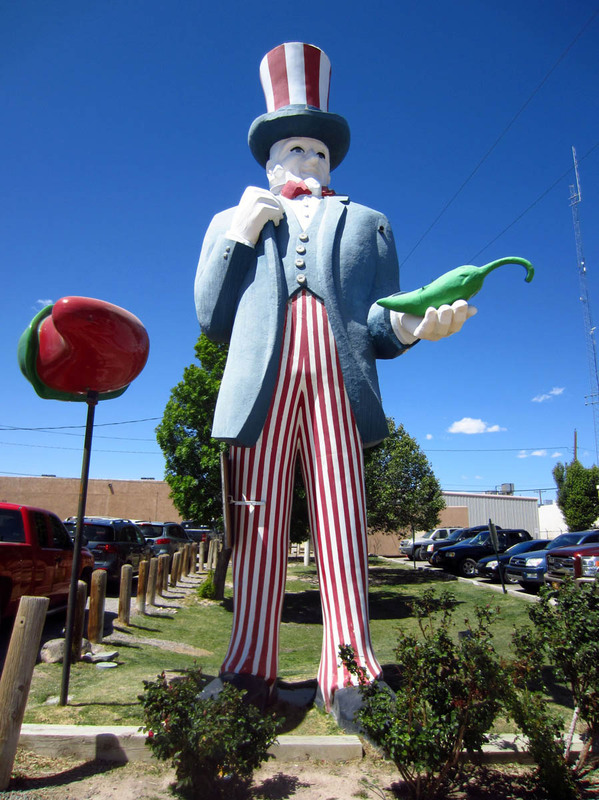 So where better for a little “TLC than T or C?” Truth or Consequences, New Mexico. I needed a place where I could park the rig near the hot springs, and Riverbend Hot Springs seemed like the dream situation. Full hook-ups with unlimited soaking right across the street. My only objection was a hefty $55 a night fee for a gravel parking lot! I would have to do a LOT of soaking to justify that price, but after a few weeks of feeling like I am shriveling up in the dust bowl, I was up for the challenge! 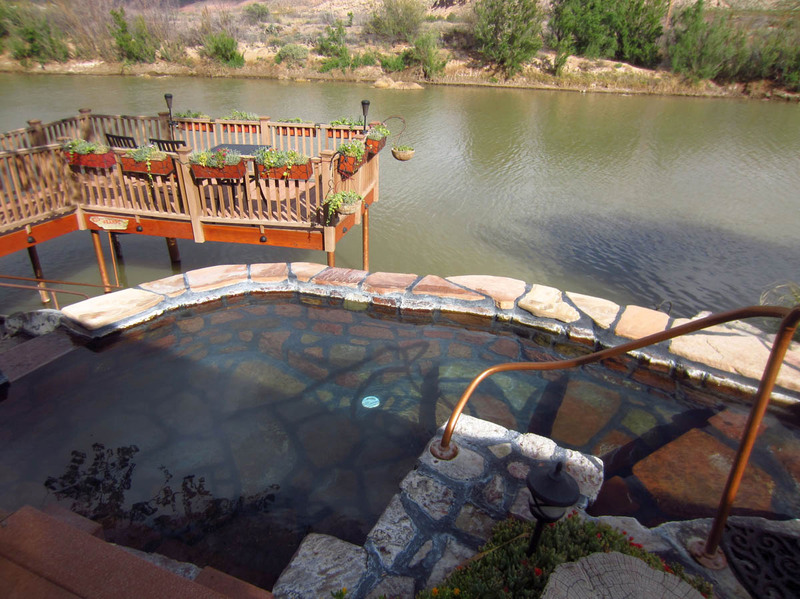 Riverbend Hot Springs is full of zen-inducing charm. It is small, so it can feel crowded very fast, but thankfully that didn’t happen too many times during my three night body-soaking vs wallet-soaking challenge. 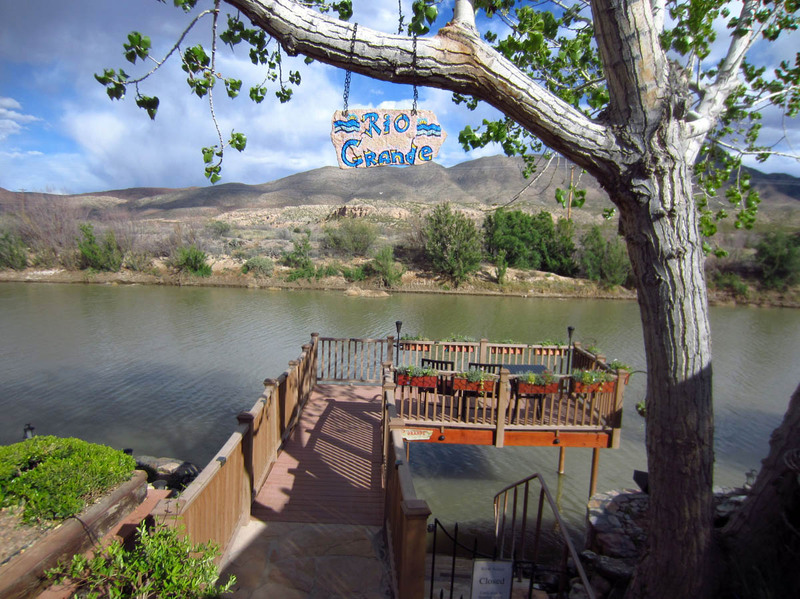 They have several pools of varying temps, but by far the primo spot is overlooking the Rio Grande. Though the river is dry in most places, it is dammed up to hold water in this area. As I understand it, this is to keep pressure on the hot springs to insure flow. Riverbend has installed tiny twinkly blue and green laser lights on the roof which reflect into the nearby trees and reeds, and dance across the river making it appear like an enchanted oasis after dark. 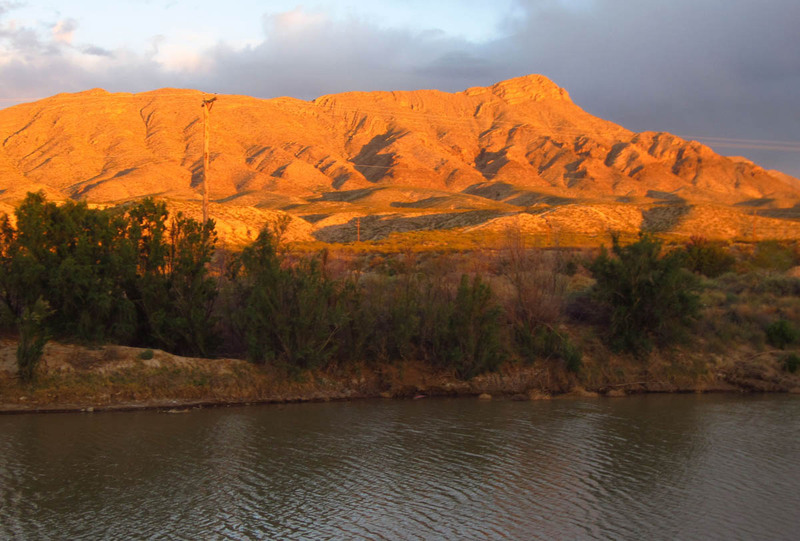 View of Turtleback Mountain at sunset from Riverbend Hot Springs. 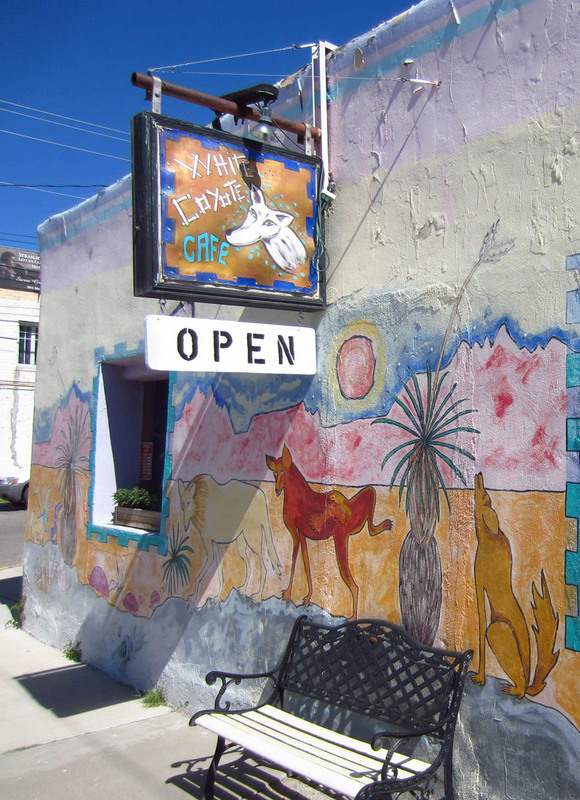 There are some cute little cafes and great quality restaurants in T or C. My two favorites were the White Coyote Café, which has great breakfast quiches and fresh baked goods. And Latitude 33, specializing in Asian Fusion. Both offered their own brand of TLC, after such a long stretch of eating my own cooking. 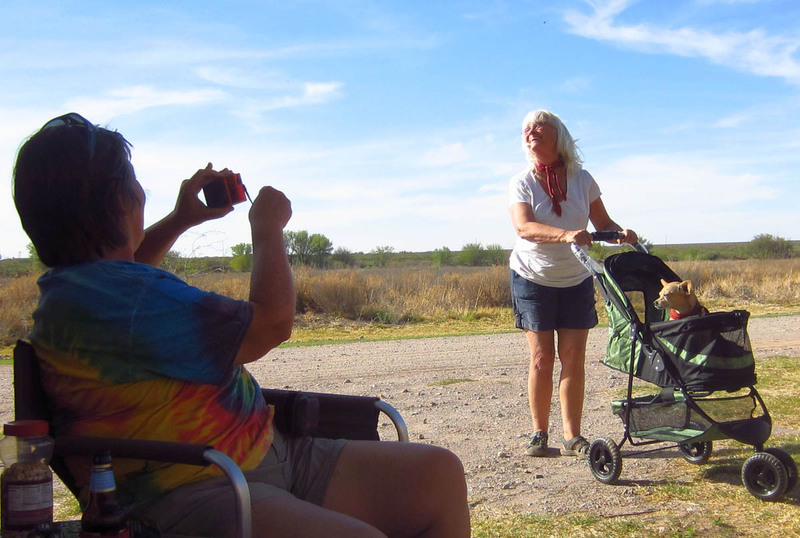 And what better way to soak up some TLC than a visit with fellow nomadic bloggers? 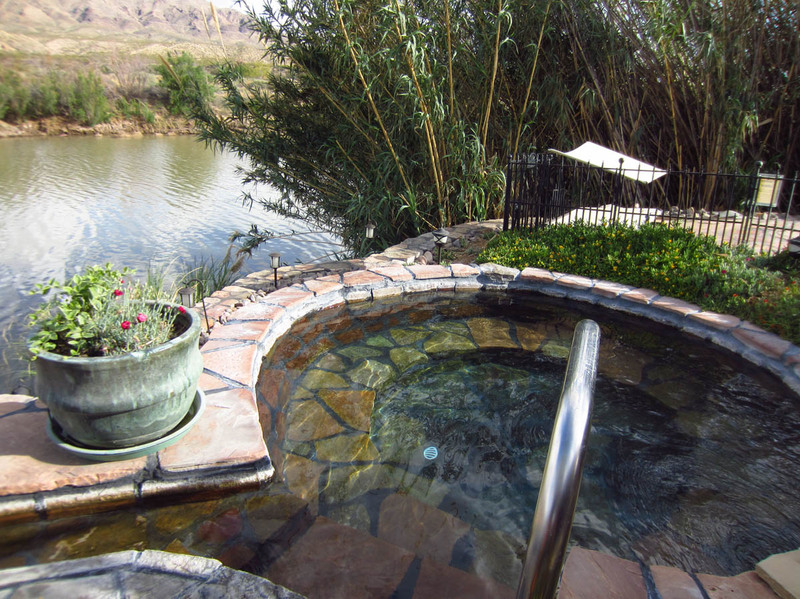 After my indulgence at the Riverbend Hot Springs, I moved on down the road to the Caballo Lake State Park, and dropped my nightly rate from $55 to $14! But the real reason was to stalk some of my favorite bloggers. Roxanne and Annie were the first bloggers I ever met, back in 2011 at the Georgia “WSGGTG” (Women Go Solo Get Together) — they, in the biggest rig I had ever seen, the Good Luck Duck-mobile, and me in my tent. 😉 I was just an RVer wanna be back then, so it was great to see them again and talk about all has transpired since that first get together. Barb and Katie preparing for their close-up. 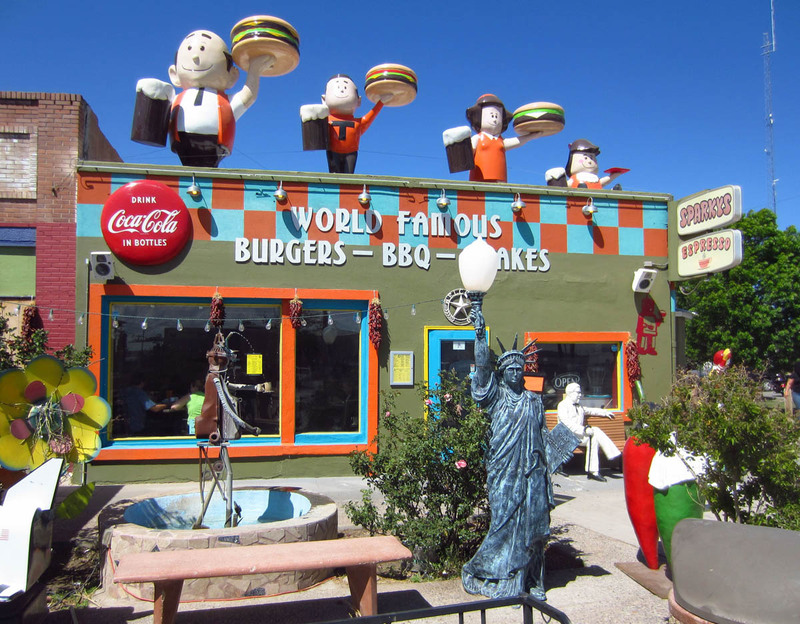 This entry was posted in New Mexico, State Parks and tagged Caballo Lake State Park, green chili cheeseburger, Hatch, Riverbend Hot Springs, Sparky's, Truth or Consequences by Suzanne. Bookmark the permalink. 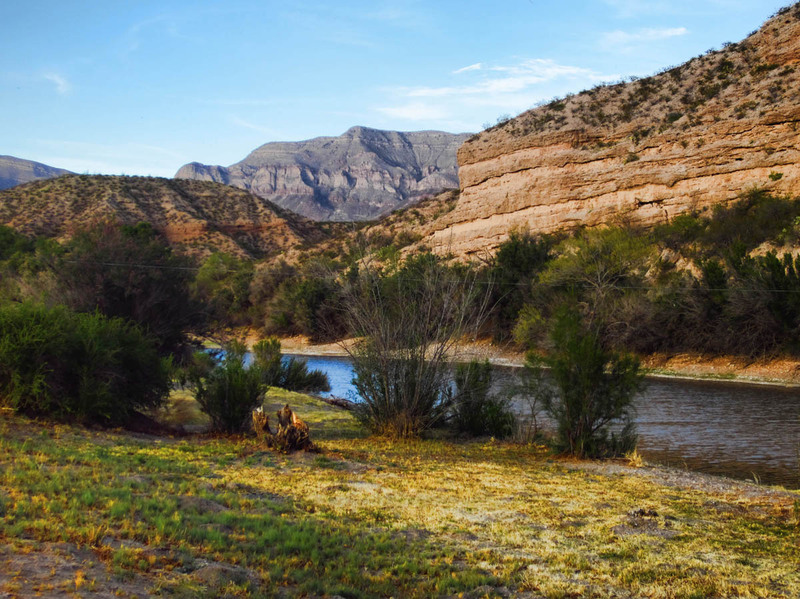 Ho hum, another hot springs along the Rio Grande, eh?!! Well, this one looks really FABULOUS, even if it is that expensive (certainly missing the skanks and drifter dudes at that price! ha ha!). 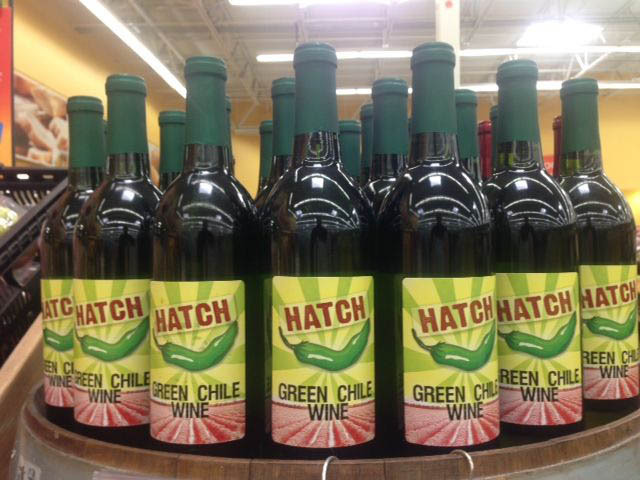 Looks like you found some great eating places in Hatch and TorC too. Glad you were able to meet up with the bloggers too. What fun! Again, Suzanne ~ you see the beauty and artistry where I don’t. 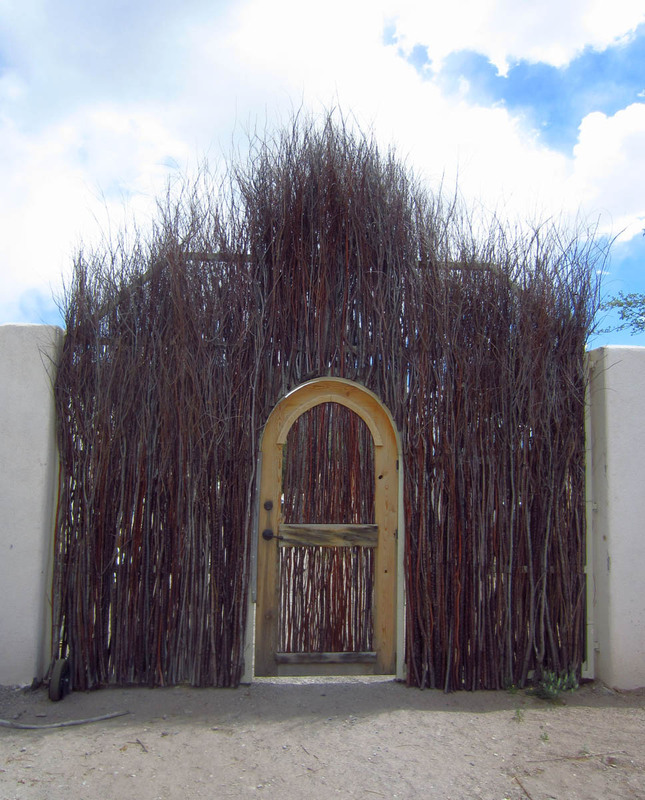 I was at the same places … camped though at Elephant Butte. Just not my thang… the lake was way down but the colors were gorgeous. and the air was great. I do relate to unsettledness … its the … well then … that keeps slapping me in m’face. You mojo will return .. always has .. always will. That’s what I kept/keep telling myself. Bummer on the debris! I hate that… I had to replace Homer’s windshield because of such debris! always seems stuff happens in threes… your cable, latch and retractable shade are your three and well! hells bells! you already have a preemptive one of your next set of threes! the alternator… hate it when the alternator doesn’t work. What route are you taking farther west? Barb — It was great meeting you also! I really enjoyed the conversation. And that riverside site seemed like the perfect place to unwind with a beer as the sun lit up the mountains, didn’t it? I wouldn’t blame you for returning! Caroyn — Your words are soothing to me. Thank you. 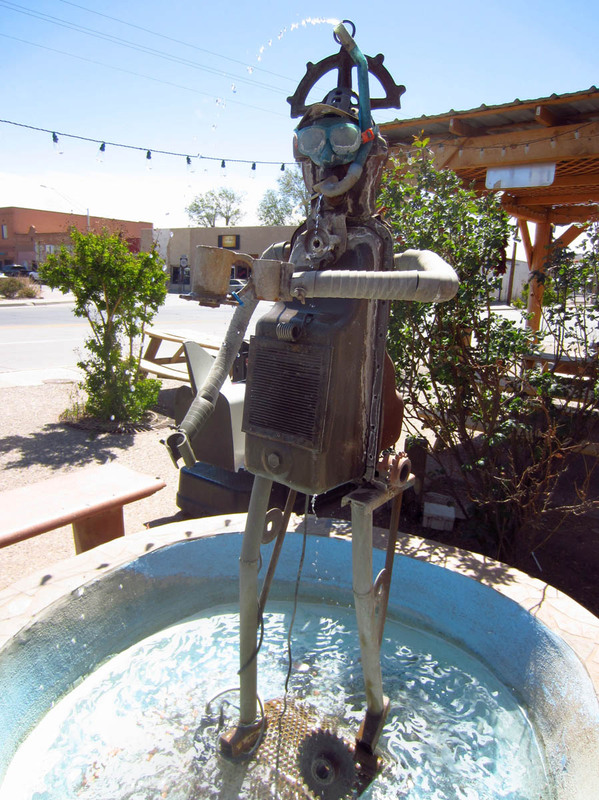 I will try your “whisk broom technique” on my 160 remaining miles to Tucson in the morning. 😉 I will continue on from Tucson to Phoenix (briefly!) then start pointing north pretty quickly, as I have 1,000 miles to go yet if I am to make the rally on time, and I can only travel on the weekends. oui! I will miss a lot along the way, but plan to work my way slowly back down from WA. I will be checking AIGSP for tips! My name seems “add insult to injury” but I can’t keep from saying this – that area you are driving through belongs in a photograph or in an illustration created from that watercolor board of yours, but only hung on the wall – not in the back yard! I think the Native Americans dealt with that area by putting a little peyote in the peace pipe. Maybe you should have a little hit, call into the weekly team meeting and see what happens. That would either land you a more fun position or get you fired, and you probably couldn’t lose either way! Well after Austin and/or Asheville, peering across rattlesnake droppings in the sunset can’t be that much fun, but I am speaking from my own warped sense of beauty. My thoughts of that area run to the affection of the open range by “Curly” from the movie “City Slickers”. Sounds like it’s time for an all weekend drive to hit the local brewpub and grab some California, Oregon or Washington green! Or drive back to Texas to give Winnie a Don spa treatment (with more wires to break LOL). A hot tub in a scenic area, a cigar, ice cold beer and a good book. It don’t get no better than that. I’ll bet the problems with the Winnie and moving along seemed much better after wards. Keep on rolling. we who have no wheels as yet read in envy. Don’t fret, even at 55 a night that’s still cheaper than what I pay for a 1000 sq ft apt and that doesn’t include utilities. Enjoying your new found blog since I do want to go FT’ing the sooner the better which would mean pulling an 8 to 5 working while doing it. Don’t get discouraged. Like you said, if not this, then what? A house or condo has the same or more expenses. I had the same issue with my ’08 (and am now seeing it from time to time with my ’07 too). The culprit is most likely the $30 solenoid that connects the alternator power to the house batteries– these fail every couple of years. In the ’08 and newer Views, its located inside the passenger seat pedestal. In 06/07 Views, its in the floor box between the 2 seats. Hope you’re still having a blast on your trip! Enjoyed meeting you at Big Bend too. It’s so dangerous when crap falls off someone’s vehicle & hits other vehicles! A young woman was killed on I-5 here in Washington a few years ago. The Legislature got their act together & passed a law that requires people to tie down their loads SECURELY or face a huge fine & ticket! It’s helped so much! Have a fun trip to Oregon. Very nice tubbing there on the river & what fun your blogger meet-up must’ve been! That Katie girl is becoming very well-known! Hi Suzanne – I don’t think it matters where you live, something will always have to be fixed. Even in a tent, your pole could break! Too bad someone can’t come up with a repair less abode. I was just in Phoenix, needed a break from our springless spring so jumped a plane to Phoenix and headed to Sedona by route of Prescott and it was snowing there too. I was so surprised! The next day it was back to nice temperatures. I took my computer with me and it wasn’t behaving properly either so I can understand your frustration with working full time in a mobile environment. Maybe the world is trying to tell you something!!! You are worth every penny of that $55.00 plus $1000.00 more. I sure hope you got soaked well and good. So sorry to hear about the road trauma but these things happen when you are traveling. 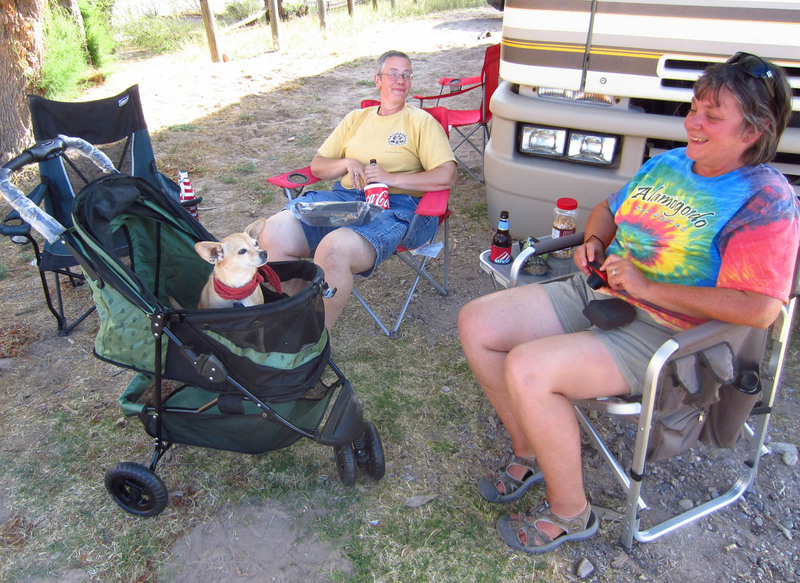 Our RV is 13 years old and each year we have one or two major traumas, each around $1000.00. But one does what one has to do to enjoy the lifestyle. It was fun to sit with you not just once, but twice! when I was living in phoenix, az. i went to a place that was called sheeps crossing & it had a home made hot tub in the middle of a desert in the middle of nowheres, but it was a fun day. wish i could remember what city it was actually in. Yes, the charging solenoid is a known problem on Winnebagos. I’ve had two fail on my motorhomes over the years. You’d think WB would use a better quality solenoid. The solenoid senses when the coach batteries need to be charged and then shuts off the charge when the batteries are full. Sort of like a thermostat on your furnace. They are not hard to replace, if you are handy with a couple of wrenches, you can change it out in about 15 minutes. Just make sure to disconnect the batteries first.